Many top economists use the IS-LM model to support low interest rates. The LM curve of the IS-LM model is built upon a model of financial markets. In the graph above, money supply has been pushed far to the right to keep interest rates low. The model implies that the money supply would eventually have to be reduced in order to raise interest rates, but the Fed has other ways to raise interest rates. But there is a glitch to pushing the money supply so far to the right. Low interest rates help unproductive firms stay in business. And we have had low interest rates for years now. The Wall Street Journal had an article showing how inequality is growing between identical workers, because productivity differences between firms even in the same industry have widened. (link) So there is evidence that low productive firms have become more prevalent. Creative destruction is an important part of a proper interest rate cycle. Proper interest rates keep low productive firms at lower levels. These low productive firms drag on productivity, wage growth, investment and potential growth. A higher prevalence of unproductive firms supports the case for low interest rates. But the purpose of low interest rates was not to increase unproductive firms but to keep them from crashing too fast. Now they are not being allowed to crash at all. Thus, the glitch. An efficient economy where resources are allocated to maximize net social benefits must have a proper interest rate cycle for creative destruction. The Fed missed the interest rate cycle this business cycle, so the prevalence of low productive firms has increased. It will be very difficult to raise interest rates because the economy now depends on these low productive firms. A rise in interest rates will push many unproductive firms over the edge and start a cascading downward of the economy. The economy has become more sensitive to interest rate hikes due to an increased prevalence of unproductive firms. Interest rates will have to go through a properly disciplined cycle to get the benefits of creative destruction. Or the unproductive firms will be pushed out anyway as profit rates decrease at the end of this business cycle. Either way, there will be pain for some. Are companies that have cash on hand and choose to pay employees more through profit sharing or simple cash bonuses or higher wages unproductive? Such a company might be quite healthy, with large margins or volume to make up for it, and lots of cash available. Since payrolls potentially contain large amounts of bonuses (discretionary compensation), financial risk in a downturn could be quite low. Nonetheless they might not report much in profits or pay much in taxes. I would view that as the best case scenario for a company, one that shares the wealth with it’s community of laborers instead of turning it over to absentee landlords, but the landlords might well regard it as a business failure. Read the article linked to in the post. It discusses how productivity is low in many existing firms such that they cannot raise wages. This issue goes to the study of how costs need to cover social costs in order to maximize net social benefits. For example, there is an ideal minimum wage that covers the social costs of labor which raises net social benefits and produces more productive human capital. The same idea goes for the cost of money. There is a price of money which covers the social costs and then raises net social benefits. When the interest rate did not rise, net social benefits fell as unproductive firms began to drag on the economy. The situation is worse in Europe. It’s not clear to me that what the paper says is necessary what you are saying, or at least that that is the primary argument. It is not the primary argument of the paper. The difference in profitability and productivity is given as a cause of the inequality. Firms are very different now in their profitability. That is a result of low interest rates giving a life line to firms that would normally have been pushed off the margin making way for more productive firms. 1. Firms are not high productivity and low productivity as a function of their unchanging nature, but as a function of things like how old their equipment is, whether they have a strong market position in their product (productivity in money terms and productivity in terms of output are quite different things – productivity really is a relative measure). 2. Getting rid of “unproductive” firms has exactly the same meaning as getting rid of jobs. This is no problem if there are other jobs for the very people losing those jobs to move to – but such jobs do not appear by magic (no matter what right-wing economists may like to pretend). 3. If a firm really cannot improve it’s productivity and the labor market is tight, then these firms will be driven out of business by rising costs, you really do not need to force them out of business. May I humbly suggest that interest rates are low for a reason. 4. Your diagram does not make any sense. 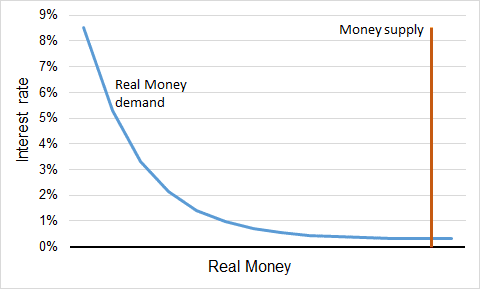 The demand for money does not go to infinity at interest rate 0 and the supply of money is not fixed. The whole reason for low interest is to encourage lending which INCREASES the money supply. Let me get a little wonkish… Profit rates tend to parity among different industries. So that you would end up seeing the same profit rates among various industries. When one industry has large profit rates, money moves into that industry until profit rates equalize with other industries. Now within an industry, there are firms that are more profitable, more productively efficient. It so happens that when other industries equalize profit rates, they do so with the most profitable and efficient firms in other other industries. The lower productive firms in an industry eventually get weeded out. Getting rid of unproductive firms is not getting rid of jobs. It is getting rid of socially unproductive firms. When you get rid of an unproductive firm, you create better jobs in more socially productive firms. Why do I say socially? Because more productive, more profitable firms allow wages to rise more which benefits society. You are not quite right that these unproductive firms will be driven out of business. Just look that defaults and bankruptcies have been low recently. They are not being driven out of business as much as one might think. They are being given easy monetary conditions to stay in business. But it is actually not socially efficient to keep them in business with easy monetary policy. The diagram does make sense… Think of the diagram as loanable funds. When interest rates are low there is more demand for loans. Why? because low productive firms can afford low interest rates, but they cannot afford maybe a 2% interest rate. So as interest rates go low, the economy allows in socially unproductive business activity. That is good if you want to restart a business cycle after a recession, but during the recovery, you really want to tighten the ship and weed out socially unproductive activities with proper interest rates. Your whole argument seems to depend on one phrase “making way for more productive firms” which you have nowhere justified. Why do you think that unproductive firms (and if they are in the same industry as more productive firms why aren’t they being driven to bankruptcy by price competition) are standing in the way of more productive firms? Where are these more productive firms supposed to come from? Your answers don’t make any sense, none of them. Why do you think that? How are these extra jobs magically created? Why do think that “socially unproductive activities” are selected for or against preferentially by interest rates as against by rent or wages (or recruitment problems). .. The central bank can control the interest rate BUT not the quantity of money (increased lending increases the quantity of money) – there is no fixed supply. Don’t you ever read any MMT stuff (this bit is not disputed by most neo-classical economists). We did this experiment as well and the central banks gave up money supply targeting. Look, sorry but I’m a skeptic here, I don’t believe any of this “you got to prune out the dead wood” stuff (i.e. liquidationism). If something better grows (and firms are always growing and shrinking) then it can PULL resources from other uses, by paying more for them (and that is what we want). The resources don’t have to be pushed out by high interest rates or anything else. Besides which, I don’t think you understand stagnation – a stagnant economy is differently structured that a growing economy, you cannot assume that what is struggling now will continue to struggle in another macro-environment or vice-versa.